Visit Lake Natron during a walking safari and discover flamingos, exotic birds and waterfalls. 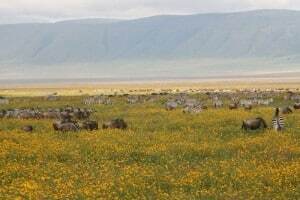 Lake Natron is situated in the north of Tanzania near the border with Kenya. This 50 km long alkaline lake is famous for its large flock of flamingos, one of the biggest breading areas in the world. The lake has frequently a pink glow, thanks to the billion of pink micro-organism called spirulina that grow in the lake. This is the only lake that has these organisms, therefore you can find 2.5 million flamingos in this area. The temperature around the lake can rise to 50 degrees Celsius, by these high temperatures it is safe for the animals to build their nests, because the carnivore does not enter the crater area in these temperatures. The lake lends itself very well for walking safaris, you walk along the lake with flamingos and other exotic birds, and you will visit two waterfalls. Mounting Ol Doinyo Lengay is worth a visit too; this still active volcano gives you some very good views over the Maasai grass lands.